As I write this, I am lying next to my youngest son in his toddler size bed, balancing my laptop on my knees, sharing a Lightning McQueen blanket. I try to take to heart the secret that all wise women a decade or so ahead of me know: “enjoy it. It goes so fast.” I know that in a few years they will lock me out of their bedrooms, and not let me hug them in public. My mother in law once told me, “you love your kids the most when they are sleeping.” How true. When my son was a baby, I used to sit and watch his eyelids bob up and down in that sleepy dance, and witness the exact moment when he finally relaxed into dreams. It’s the most glorious thing, a deep exhale. Everything seems right with the world when my kids are tucked in their beds where I know they are safe. In that moment, it doesn’t matter how I got them to sleep. It doesn’t matter if I’m a working, a stay at home, a helicopter, attachment, green, vegan, ferber, or any other qualifier we feel the need to put in front of the part that really matters: Mom. 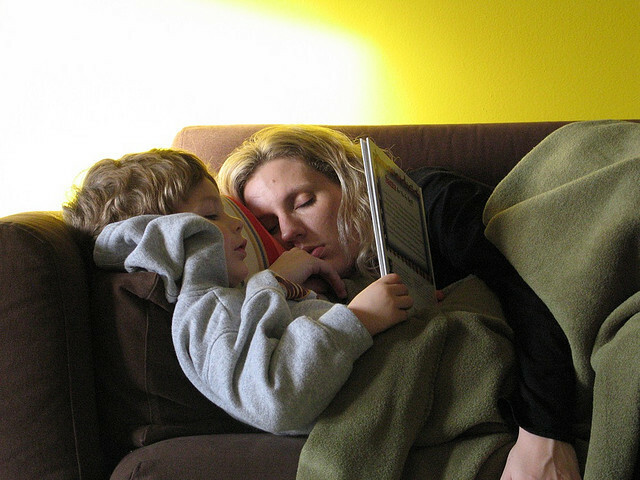 Sleep is the white whale of parenting— elusive, enticing, driving us all to madness. Through the six years I have been lucky enough to be called “Mama,” the most important piece of advice I have ever gotten has been, “trust yourself.” There are an infinite number of books, articles, message boards, and well meaning friends that will offer all sorts of conflicting advice. At the end of the day, you will have to put your hand on your heart and decide which ones feel true for you, let everything else go, and know that you are still going to screw it up sometimes. The first time I knew I had no idea what I was doing as a parent, was the night I brought my son home from the hospital and realized I didn’t know how to put him to sleep. I had read ten pregnancy books but didn’t even know there was such a thing as different methods for getting baby to sleep through the night. We first started co-sleeping because I kept getting up to check that my son was still breathing. The bassinet on the other side of the room felt miles away. Sometimes when he would wake up early I would put on baby einstein videos and be able to get an extra half-hour of sleep while he sat mesmerized in front of the tv. My doctor told me that nursing him to sleep was a bad habit. I did it anyway. I used to take two hour naps with him laying on my chest. Everything revolved around nap time. My two boys who are now 3 and 6 have their own bunk bed, but we still all sleep in the same room. Every article on facebook tells me how important sleep is and it’s infuriating. Sometimes I let my 3 year old watch videos on my iphone until he falls asleep. Sometimes I let my 6 year old sleep in my bed. My 3 year old still finds it comforting to reach into my shirt and rest his tiny hand on one of my breasts, or “nummas” as he calls them. He often falls asleep this way. I have spent many hours and lots of gas waiting for children to fall asleep while circling the block in the car. I envy mothers that kiss good-night, close the door, and go on with their evening, but I’ve never felt compelled enough to try and be one. A rustle of blankets is enough to wake me up at 2am. In the morning, the boys pile onto my bed (if they are not already sleeping there) and immediately start wrestling and rolling around like puppies. Sometimes I laugh, and sometimes I hide under my pillow and try not to get kicked in the face. I don’t want to hear about your baby that has slept twelve hours straight since the moment they were born. I do want to know what show you binge watch after the kids go to bed, or what book you are reading, or wine you are drinking. I still live for that moment when the eyelids close and their breath becomes deep and rhythmic and I’m free to do whatever I want, including linger a few more minutes and tell myself I’m the luckiest mom in the world. * This post first appeared on Mogul, a women's website where I am now a contributing writer!